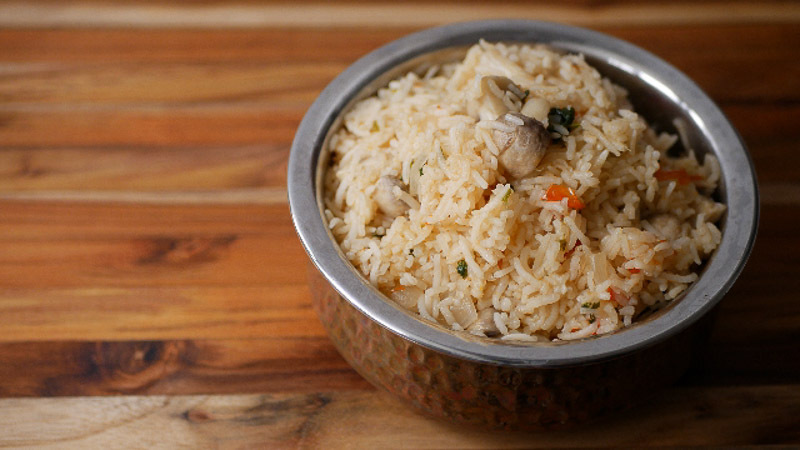 This easy beginners mushroom rice is a quick recipe that can be put together in under 30 minutes. The ingredients are very simple and makes for a delicious lunch box or a quick dinner. Soak 1.5 cups of basmati rice in water before starting to cook. Let it soak for at-least 20-30 minutes. Soaking the rice is an important step. The rice wont become mushy when cooked later. Heat ghee in a pan and add in the cinnamon, cloves and cardamom. Note: Instead of ghee, you can substitute oil of your choice. Also for a rich pulav, add an extra tablespoon of fat. Add in the sliced onions and saute for a couple of minutes till the onions are soft. Add in the chopped tomatoes, slit green chillies and salt. Add more green chillies if you want a spicy rice. Adjust accordingly to suit the taste of your family. Grind the garlic, ginger and green chillies in a mixie along with 1/4 cup of water to a smooth paste. Add it to the pan and saute for 5 minutes till the tomatoes and the paste are cooked. Clean, Wash and Chop the button mushroom and add it to the pan. Note: After washing the mushrooms, use it immediately. Mushrooms are like a sponge. It will absorb the water while washing and it wont stay well if refrigerated. So once washed, cook them straight away. Cook the mushroom for 5 minutes. The mushrooms will shrink in size when cooked. Add in 3 cups of water. Let the water come to a boil. Once the water comes to a boil, add in the soaked and drained rice. Cover the pan and cook for five minutes – (Medium flame). Open the cooker and add in the chopped coriander leaves. Cover the pan and cook again for five more minutes. The rice will be about 75% cooked by this time. There will be some moisture left. Now is the time to switch off the flame. Cover the pan and let the rice rest for 15 minutes. The rice will absorb all the excess moisture and will be perfectly cooked after the said time. After 15 minutes, open the pan and gently fluff up the rice. 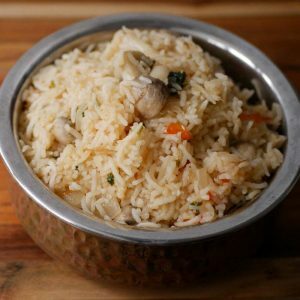 Easy mushroom rice is ready. Serve the rice with Vegetable kurma, Egg masala or chicken kurma. Soak 1.5 cups of basmati rice in water before starting to cook. Let it soak for at-least 20-30 minutes. Add in the sliced onions and saute for a couple of minutes till the onions are soft. Add in the chopped tomatoes, slit green chillies and salt. Grind the garlic, ginger and green chillies in a mixie along with ¼ cup of water to a smooth paste. Ma’am, should we use the cooker weight if making this in a cooker or simply close the lid? just close the lid and follow the steps. no cooker weight. Made this for dinner.It tasted delicious.Thank you for all the wonderful recipes! If I cook 1 cup or .5 cup will cooking time in steps 9-11 need to be adjusted? No. It wont change but please don’t use a very big vessel if you are making a smaller quantity..